This exclusive product has been synergistically formulated to restore your body while you sleep. With its advanced antioxidant and anti-inflammatory containing properties delivered in a fast acting softgel, R.E.M.edy improves the body's ability to recover from strenuous exercise or everyday life. R.E.M.edy provides the most potent and comprehensive recovery complex blend. R.E.M.edy is the first Premium Altai Moomiyo softgel supplement that penetrates quickly to prevent and heal muscle and joint damage while you sleep. This exclusive formula provides one of the world's strongest adaptogens, widely used by top performance athletes and cosmonauts, combined with other nutrients which aid in the relief of swelling and inflammation, relaxes sore muscles, strengthens muscles and joints, treats bone fractures and strains of muscles and ligaments, and alleviates symptoms of pain while providing a better night's sleep. Rapid Eye Movement (REM) is the most vital stage of sleep in which the body recovers and heals from stress and damage. For optimal recovery, it is important for our bodies to obtain proper nutrients before bedtime in order to completely heal and regenerate. R.E.M.edy provides essential support and can optimize the results of this regenerative process for the synthesis and release of strength healing hormones. 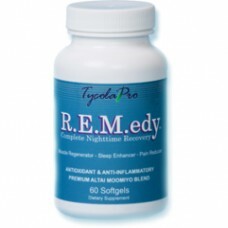 Achieving optimal sleep with R.E.M.edy is essential for the maintenance of good health, and it is equally beneficial for non-athletes who wish to nourish and support their muscles and all systems of the body.